Are you ready for part two of Crocktoberfest? I bet your crockpot is definitely ready. Because today we are sharing main dish recipes. Which is probably what I use my own crockpot for most often. And my contribution? 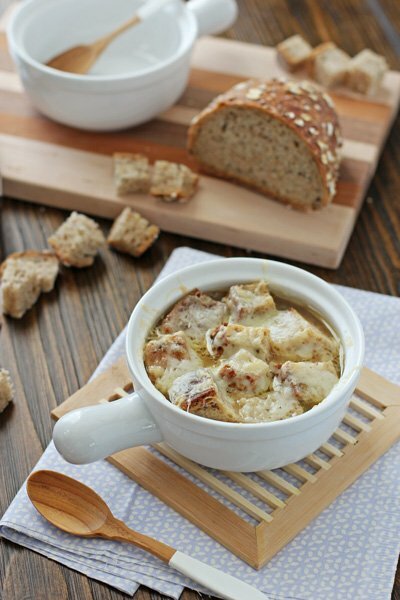 Crockpot french onion soup. And oh is this a good one. For years (no joke) I’ve tried to find my favorite way to make french onion soup – this search began long before I even started this blog. After a lot of experimentation, I decided I preferred to do it in the crockpot. But then I couldn’t find a recipe that I liked enough to make over and over again. Let’s just say that we’ve eaten quite a bit of french onion soup over time. But my husband and I finally agree – this is our personal favorite. Now this is not a set it and forget it type of recipe. But the crockpot still does most of the work for you and in my opinion is definitely worth it for the end result. The onions get so wonderfully caramelized over time, which creates the perfect base for this soup. So plan to make this a weekend type of recipe. And it makes a ton of food – we always freeze at least half for another time. So once again I’ve teamed up with my friends to bring you 17 other delicious main dish crockpot recipes! Yes, 17! So be sure to mosey on over to their sites to take a look. And if you love crockpot dishes then also check out #crocktoberfest2013 on facebook, twitter, and instagram to find all the other recipes that will be shared this week. Recipe for crockpot french onion soup. Let your crockpot do all the work for this classic soup with caramelized onions, crusty bread and plenty of cheese. Turn on your crockpot and set it to high. Add in the butter chunks and then put on the cover. Once the butter is melted, add in the onions. Mix to combine. Put on the cover and let cook for about 1 hour. After the first hour, give the onions a good stir. Place a double layer of paper towels under the lid (which will help to absorb some of the moisture – you’ll want to replace this layer about 2 to 3 times during the cooking process). Continue to cook on high for about 5 to 6 additional hours, stirring the onions about every 35 to 45 minutes. * You want the onions to be a caramel color. Toward the end of the cooking time, keep a closer eye on the onions (you don’t want to let them burn and may need to stir them more often). Discard the paper towels. Turn down the crockpot to low. Add in the broth, bay leaf, garlic, salt and pepper. Cover and cook for 1 hour. Discard the bay leaf and then taste and adjust with additional salt/pepper if needed. Preheat your broiler. Place oven-safe bowls or crocks on a baking sheet. Spoon the soup into the bowls. 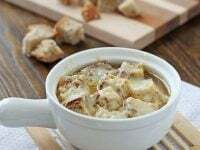 Place a handful of bread cubes in each bowl and then sprinkle the top with some of the cheese. Broil for about 2 to 4 minutes, until the cheese is golden and bubbly. Depending on your broth, you’ll need to adjust the amount of salt to your taste. I’ve found that different brands of low sodium broth will vary in how salty they are – so just taste and adjust as needed. You can always add more salt later, so start with a lower amount and go from there. *I have a small 4-quart crockpot, so it may take less time for caramelizing your onions if your own crockpot is larger. Just keep an eye on them.